In 2010 renovation works at the Bibliothèque nationale necessitated the temporary removal of Houdon's statue of Voltaire from its time honoured place in the Salon d'honneur, rue Richelieu. Imagine the consternation when the statue began to omit a noxious odour! On Voltaire's death, his heart was removed and appropriated by the marquis de la Villette who placed it in a precious metal box, bearing the suitably uplifting inscription: "His heart is here but his spirit is everywhere". 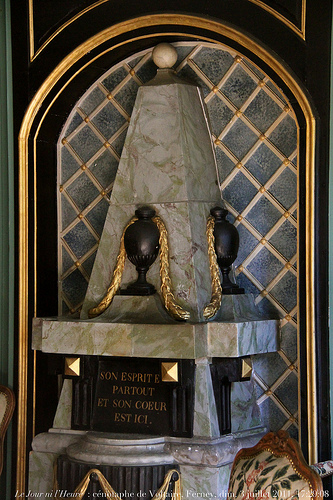 The marquis managed to buy the estate at Ferney from Madame Denis and briefly enshrined the heart there, its casket installed on a velvet cushion before a pyramid shaped monument designed by the former architect Léopold Racle. This splendid cenotaph was surrounded by no less than forty one portraits of Voltaire's friends and guardians of his memory. 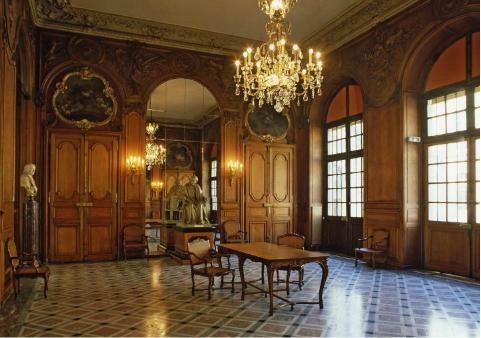 In 1785, when financial necessity obliged the marquis to sell Ferney, the heart was quietly removed to his ancestral property the Château de Villette at Pointe-Sainte-Maxence (Oise). made for the marquis de Villette at Ferney in 1781. When the marquis's son (the gloriously named Charles-Voltaire Villette) died in 1864 a protracted legal rankle resulted in the heart being given over to the French state. 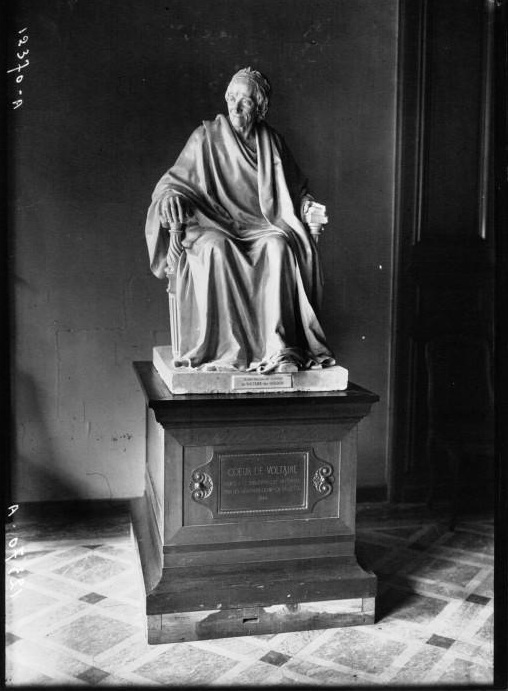 It was duly presented to Napoleon III and placed in the base of Houdon's plaster statue of the philosopher in the then Bibliothèque impériale. 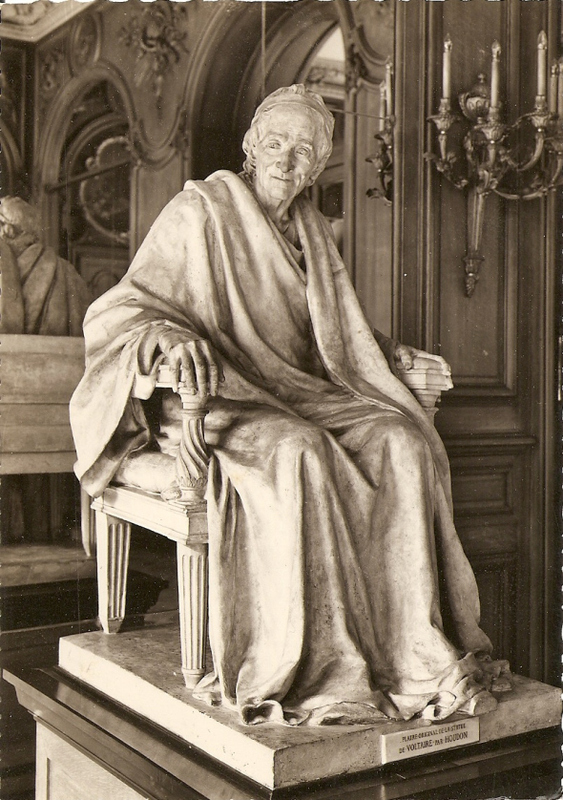 In 1924 the statue was rescued from dust-covered neglect and ceremonially restored to Salon d’honneur, complete with the heart. And there it resided undisturbed until 2010. If you like you can read all about the state of the now mummified heart and the elaborate conservation treatment it required. I have not been able to find out whether it has yet been restored to its former compartment in the base of the statue. This is such a great slice of history! 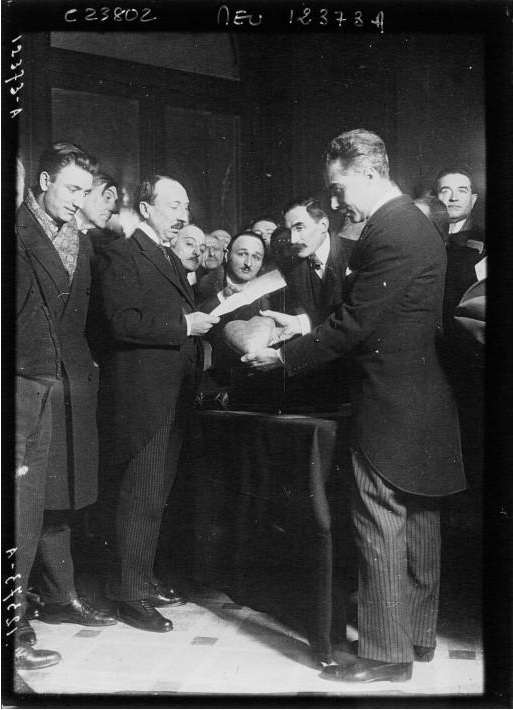 If you don't mind me asking, where did you find the above pair of archival photos ("ceremonial handover", "statue in 1924")? I'd love to use the same images for our entry on Voltaire's heart, but am trying to track down whether they're in the public domain, or if we have permission to do so… Any information you could provide would be amazing!